Photo View Postcard. Multi. Cardstock. 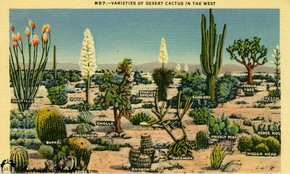 This linen-textured, color-tinted card is titled, "Varieties of Desert Catus in The West." Each of the varities are named. Pub. By Tucson News Co., Tucson. Unused.